Get your day started proper with this delicious, healthy, and easy to make green smoothie. Your body and taste buds will thank you. Mint is a great addition to green smoothies providing a little extra nutrition while enhancing the flavor. Both fresh and dried mint can be used. A few of the health benefits attributed to mint include aiding in proper digestion, cleansing and detoxification, calming effects, antioxidant rich, anti-fungal, anti-bacterial, and mint helps maintain healthy skin. 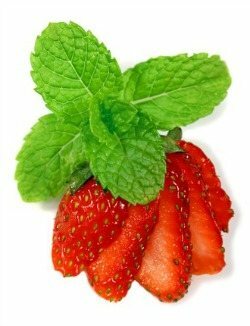 Combine mint with the goodness of strawberries, banana, and your favorite green leafy vegetable and you have one healthy smoothie. Naturally, mint pairs well with chocolate. Hmm, a strawberry mint chocolate green smoothie sure sounds good. There’s a nice upgrade to this recipe. Enjoy! I’d love to know if you tried and enjoyed this strawberry mint green smoothie – please do tell in the comments below. Happy Blending! I was looking for a healthy mint smoothie recipe to use up some mint I’d bought for another dish, and I came across this. Simple and delicious! Next I’m going to try your turmeric smoothie — what a novel idea! I’m always looking for ways to eat more turmeric, but I’d never thought of putting it into a smoothie. Thanks for the suggestion! I’m glad you liked this minty smoothie. Mint is one of my favorite ingredients. Like you, I was looking for more ways to incorporate turmeric into my diet and with all the other spices I was using in my smoothies I thought why not turmeric, and thus a new smoothie recipe was born. I hope you enjoy the turmeric smoothie. Tried this out this AM. Very good. I didn’t see a need to add a sweetener. I used frozen banana, fresh strawberry, a cup spinach, a cup kale and fresh mint. Thanks for the recipe! Thanks for sharing, Paula. Whenever you can avoid using a sweetener it’s a good thing. Cheers! I just made this and I am currently enjoying it while sitting in the sun!! It is absolutely delicious! I am considering becoming a vegetarian and I’ve been looking for different recipes and I love this one!! I used homegrown mint as well :) thank you! Made this for myself for lunch today. We have a ton of fresh mint growing in our yard, so this was a great use for it. I added chia seeds and opted for no sweetener. Delicious and very refreshing. Thanks! I was looking for a smoothie to use mint leaves leftover from a previous recipe. I opted to use coconut water and a little raw honey. It was delicious. My husband said it was refreshing. I also gave some to my 12 year old. Thanks for the recipe! You’re welcome, Nicole. Nice to hear you found a use for what I consider an underrated smoothie ingredients, mint. I made this smothi with almond milk. But find the mint with strong scent. It smell a lot. You’re welcome, Ella. Can’t beat freshly picked mint. Sitting here at my desk getting ready to start my day. Drinking my smoothie with a little honey and chia seed added. Love the taste it makes me want to be on the beach. Instead of being in Missouri on this rainy day. Hello, I’ve literally just made this smoothie, it’s delicious! Very smooth & refreshing, perfect for this hot summers day – Thank you ! Nice to hear you enjoyed this smoothie, Abbie! Wow one of my favorites for sure!